In large bowl, mix sausage, bread crumbs, onion and egg until well combined. Shape mixture into 12 (2-inch) meatballs. In 5-quart Dutch oven, heat oil over medium heat. Add meatballs; cook 9 to 11 minutes, gently turning occasionally, just until browned on all sides. Stir in broth, pasta sauce and whipping cream; heat to boiling. Stir in pasta; return to boiling. 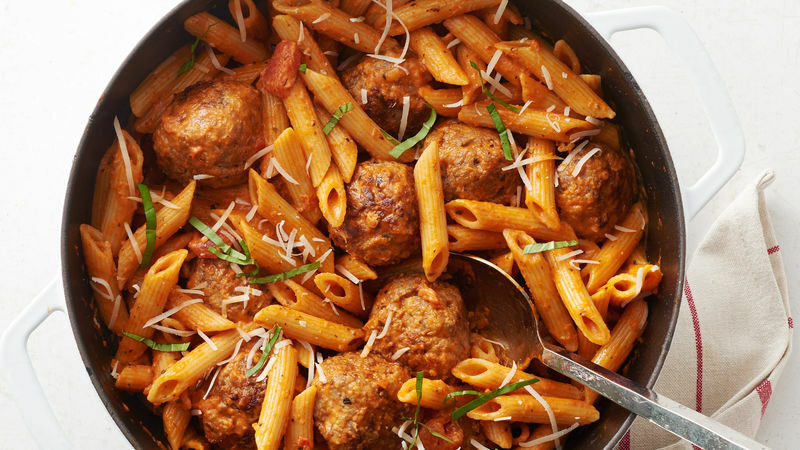 Reduce heat; simmer uncovered 18 to 22 minutes, stirring occasionally, until meatballs are thoroughly cooked and no longer pink in center (165°F), pasta is cooked to desired tenderness and sauce is thickened. Top with Parmesan cheese and basil. To easily turn meatballs, use a spatula and a spoon to gently roll each meatball. Make sure oil is hot before carefully adding meatballs. If meatballs don’t release easily from bottom of pan, cook a bit longer before attempting to turn. Like it hot? Opt for spicy Italian sausage.